This is essentially a 'test' as it’s the first time the company has done a marketing campaign via this media. "Representing the largest spend on advertising in the month of November that the company has made in its history, it’s a confident brand debut to a new, bigger audience. ‘Out of home media’ are the screens and posters you see in often outdoor public places. CW will be on the large full-motion screens beside timetable boards in major rail termini, and on cross-track posters in tube stations. Advertising here is perfect for attracting mass reach of a wide demographic target – which in our case, is business commuters travelling into and out of central London via mainline train and London Underground lines. Specifically, we know this to be a ‘connected’ audience – with smartphones and devices, ready to search the brands seen in out of home – so our creative prompts online research with the line ‘do your research’. Indeed, we have done plenty of our own market research in planning and buying the media spaces, and developing the ads for this campaign. The full-motion ad questions some of what different aspects of luxury means, hopefully provoking thought and research – which we know is a big part of thinking about buying a new watch. It’s 20 seconds long and shares 5.5% of time on screen, shown in 11 rail stations throughout London. The cross-track posters are in 10 Underground stations at interchanges with the main lines. Running from November 5th for 4 weeks, the ads are supported by additional Evening Standard advertising and online activity throughout the month. 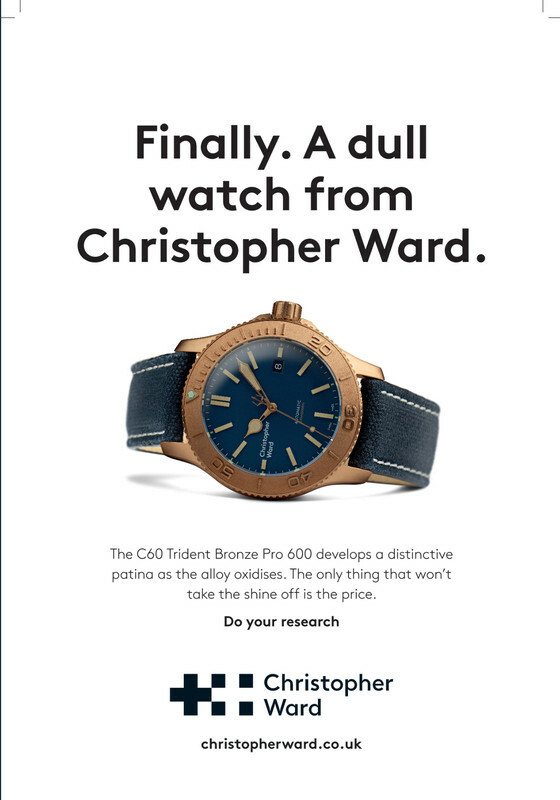 Since this is a test we’re very keen to hear feedback about any aspect of the campaign, either direct to marketing@christopherward.co.uk or via social media". Oh dear. While I applaud the decision to advertise in such a way, the content makes me cringe. Hopefully it's successful. I also wonder why they didn't register the same @ name for all social media platforms as it seems a bit disjointed. I like the ads. Especially the video. The video I like, the others not. I don't like seeking to put down other brands, which CW have some form with. How many will care if a watch is thin? How many 'more expensive' brands care either? If CW were Bvlgari fine, but they're not. But if they think it will attract the ignorant, then fine. But it might backfire with watch nerds that may be amongst the target audience. The Dull watch catch line thingy, is erm, just dull. It doesn't work for me at all. Great video! And I like the ads. That video makes no sense at all. "Are we expensive enough for you?" Sounds like they are selling overpriced watches. And their "Do your research" tag line is confusing.. What kind of research do I have to do? How about CW does some research and tell the customer why they are better than others? And what is or who is this 'Christopher Ward'? And the overall impression is confrontational. They need to grab the attention of rushed commuters in 20 seconds and I think the average consumer who is not into watches probably has no idea what they are talking about. The 'small hands' ad is still in bad taste and a poor attempt at political humor. nordwulf wrote: That video makes no sense at all. "Are we expensive enough for you?" Sounds like they are selling overpriced watches. And their "Do your research" tag line is confusing.. What kind of research do I have to do? How about CW does some research and tell the customer why they are better than others? And what is or who is this 'Christopher Ward'? And the overall impression is confrontational. Well, if you don't 'get it' then wouldn't you be all the more curious to find out what it i.e. Christopher Ward, is all about and 'Do your research'? That's the aim of the video. It will be interesting to see what level of traction CW get from this campaign. The 20 second video is a bold move, with CW doing something different (or dare I say disruptive! ), as the manner in which it is constructed ignores all the normal content that would typically be expected in what amounts to the equivalent of an elevator pitch. The cross-track posters will not have the same level of visibility as posters situated alongside the escalators to the platforms, but I imagine those alongside the escalators would cost more. However it may well be that where Helen has stated cross-track posters, she also means those alongside the escalators. I will have a look when I am at Waterloo on Wednesday. As I will be avoiding rush hour I will at least have the chance to see a cross-track poster on the Waterloo and City line platform - not something that would be so visible during morning or evening rush hours! nordwulf wrote: The 'small hands' ad is still in bad taste and a poor attempt at political humor. I thought the video was fine and might get people's interest. A watch brand has no place in the current political satire / abomination that is currently unfolding everyday. An easy demographic attempt to try and lure potential customers. I really detest the malvern poster. Designed by one of those annoying people that are always offended types. The video isn't to bad ,but it is a odd way to word things. The bronze ad is great, pick of the bunch. But I can't help but get a feeling of gloating or similar from all the wording. The Malvern ad will definitely grab people's attention and I think it'll go down fairly well. Not sure anyone will get the C60 ad, given most people won't have heard of CW. On second reflection, they still smack of Dad trying to be cool to me. I can’t help but think the “libtard” comment violates a forum rule? I don’t check in here to be called a libtard (guilt by association, since I consider myself quite liberal), especially since I check my politics at the door, so to speak, but will stop checking in if this type of commentary is what I can expect. Feel reee to criticize the 595 ad for being poor form or just plain bad for being political in nature, but please refrain from lobbying political insults in the process. Feel reee to criticize the 595 ad for being poor form or just plane bad for being political in nature, but please refrain from lobbying political insults in the process. They look good and, to me at least, are eye-catching (perhaps because I know the brand), but I’m not sure about any of these. What is “Do your research” meant to mean? 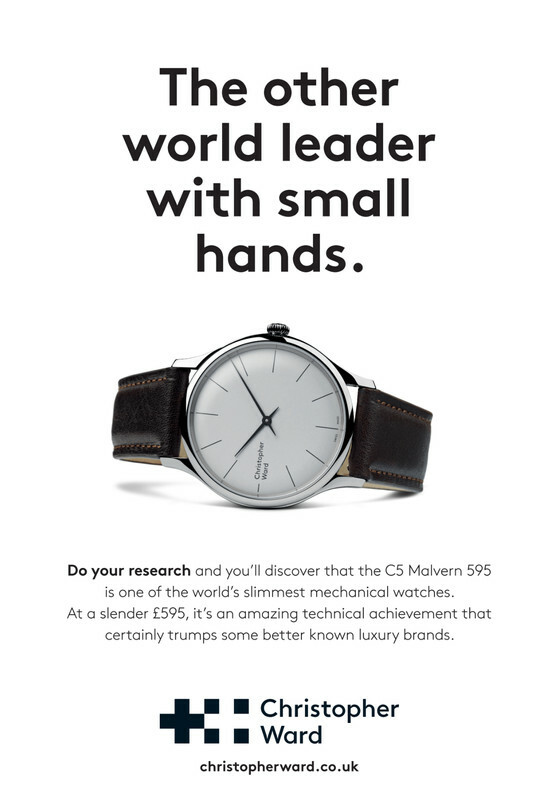 Are prospective punters expected to react by researching comparative value of a CW watch? Maybe we get it, as fans of the brand, but the average passer by may not. Buying a watch is as much an emotional decision as it is a logical one. The video is confusing - Expensive, Swiss, British, Luxury. If I have understood the message, 1 of those adjectives is a negative the others are probably positives (or are they - is British a positive? It is for me, because I am British, but is the average watch buyer on the look out for a British watch?). The Trident Bronze headline may also end up being a bit of an own goal, in a self-deprecating ‘aren’t we crap’ kind of way. I get the reference to patination, but emphasising the transformation & uniqueness would be more interesting than calling it ‘dull’. 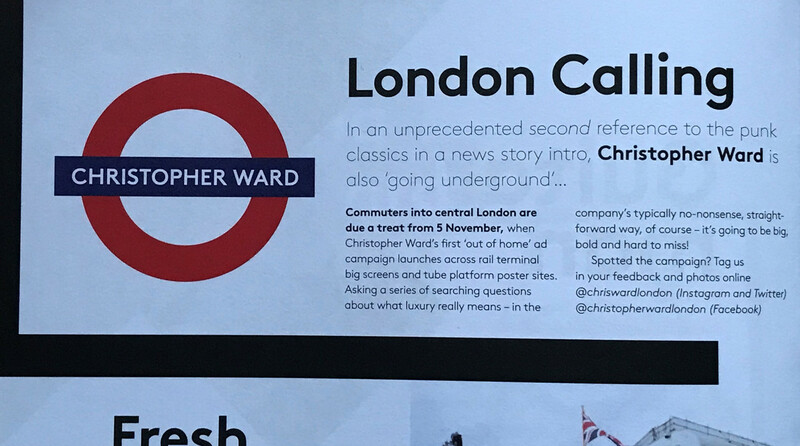 And using the handle “chrisward” is a marketing error - that’s not the brand name, and didn’t Chris say recently that the London suffix is finished? Actually, I am sure about these. They’re trying too hard and in my view haven’t worked. But what do I know? Maybe the new, younger target market will find them clever. They might have been better off simply saying “look at these great watches and you won’t be ripped off”.